By Michelle Shining ElkHow we (as American Indian people) are described or portrayed, even this day in age, has a significant impact on how we are perceived, taken seriously, or respected. Thanks Johnny Depp for perpetuating a grossly erroneous stereotype of how Indians speak–then and now. You brought NOTHING to the table in so far as your usually amazing acting skills. Like teachers influence their students throughout their scholastic programs, so do people in all forms of media and entertainment who misrepresent us as American Indian people and continue to perpetuate the stereotypes as they influence their fans, readers, listeners, followers and viewers. Thus…the perpetual cycle of stereotypes and misinformation continue seemingly without end. Popular culture, which is predominantly members of the majority constantly propagate misinformation, skewed perspectives and inappropriate depictions of who we are as First Nation American Indian people. This misinformation always ends up being internalized by those who don’t know any better or how to decipher the difference between fact and fiction. I get this movie is a “period piece”; however, never was there a time when our ancestors or our elders spoke the way Depp portrays Tonto in the upcoming Disney release “The Lone Ranger.” Thanks Johnny Depp for not exercising your gifts of being an amazing actor who is typically able to bring amazing life to your characters using that talent. Sadly and so disappointing is seeing that all you have done here is simply mimic the pathetic speech patterns created and always depicted in the ridiculous stereotype plagued lot of Hollywood Spaghetti Westerns films. Michelle elaborated in a comment she posted on Facebook:Perhaps I would not have expected more from Depp had he not said he wanted to play the role of Tonto to counteract stereotypical images of American Indians that have pervaded history. Specifically, stating he wanted “to [mess] around with the stereotype of the American Indian that has been laid out through history, or the history of cinema..."
Or, had he not announced to the world that he would deliver a more well-rounded version of Tonto unlike the original one dimensional character of the 1930s television series. Leaving us to believe he was going to deliver something fresh, new and devoid of the damaging "Injun" speak stereotype created by Hollywood. The list goes on, and I'm sure you get the point. For so many years we've managed to go farther and farther away from the "How!" Indian. So much so that our young people 16 and under have likely not experienced anything like this, until now. Imagine the confusion and embarrassment this is going to instill upon these young people as they wonder "why is he talking like that?" It can't be argued that this won't be confusing or damaging. It is bad enough that our American Indian youth watching prime time television never sees frequent or true reflections of themselves because we as American Indian people seem to be non-existent but now "Jack Sparrow" is delivering them this...a Comanche Indian Tonto. Sadly, whether we like it or not the perception is the reality and films shape perceptions that our young people have of the world they live in, and of themselves. Research on identity development has shown lack of representation AND damaging images and stereotypes make young people painfully aware of why we are viewed--or not viewed--as human beings. Much the same way that Holloween costumes dehumanize who we are as Indian people--turning us into non-existence caricatures. I had accepted Johnny Depp as Tonto, but I didn't expect him to take us so far back in time we'll need to explain, or undue this stereotype. How soon they forget the promises they make...Comment: For more on Johnny Depp, see Depp Too "Pretty" to Play Natives?! and 2nd Lone Ranger Trailer. Except Depp ain't Indian. Seriously, is this too much to ask? Why does "colorblind casting" always mean casting a white guy? Kirby Sattler pictures are the standard Facebook fake Indian profile, so of course they plagiarize Kirby Sattler. Wannabes plagiarizing wannabes. Nice. THis film was only made to entertain mindless, testesterone racing fratboys like George W Bush while wagging your tongue at natives! Long live American ignorance. Its dependable, predicatable and most importantly, Americans prefer it over the reality of America's failure as a human nation. America only built the perfect beast. I was going to say "They've ran out of 70s nostalgia, 80s nostalgia, and--omg I feel so old now--90s nostalgia. They have no choice to go back to 40s, 50s, and 60s nostalgia." And seriously, they went straight to 40s? Depp is creating an incredibly insensitive and racist blackface of the "American Indian"... it's incredible to me that he is even allowed to get away with it, especially considering that any similar depictions of non-white races is for all intents and purposes verboten in American TV and cinema; and even after we've had Michael Horse's portrayal of Tonto (The Legend of the Lone Ranger) to show us a more realistic characterization. Playing Tonto as comic relief is no excuse. I will not see this movie. While most believed that Depp sympathized with the Native American culture, most actually claimed they were Native American Indians living on reservations who said they had no problem with it. Regardless of who they are, Depp spent millions of his dollars with important message to tell us what he thinks an American Indian should look and act like. 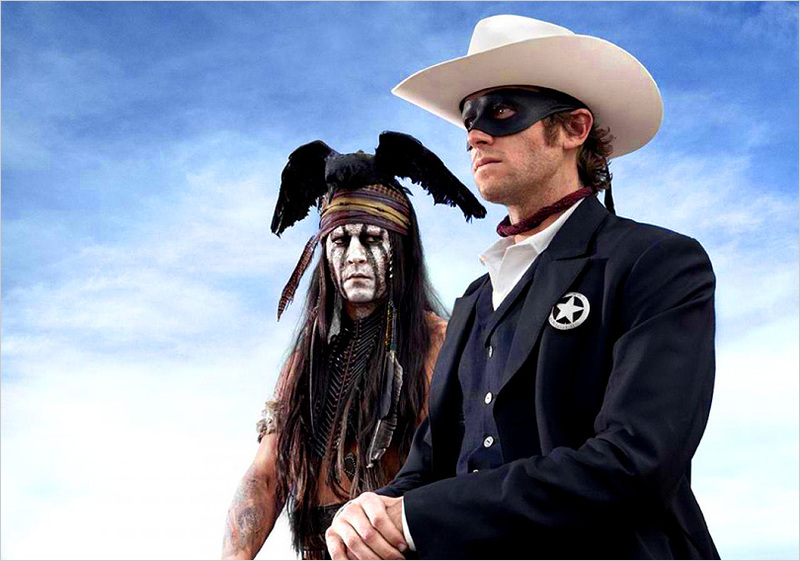 This promotional image for the movie; a handsome caucasion Armie Hammer looking relatively normal while the native, Johnny Depp looks like an angel of death talking in jibberish is a dangerous rhetoric. This is propelled not just by Depp, but once again by Disney who fuel their fairy tales with the concept of the magical "ethnic other". I agree with you all. I'll be posting more on Depp and The Lone Ranger in the next couple of months. Any group that has an interest in obtaining or achieving success in the world, at large, understands that portrayals have consequences. Hollywood continues to portray American Indian people in ways that perpetuate damaging stereotypes and inaccurate depictions of who we are and that, in turn, affects all outside interactions, perceptions and understandings that mainstream has of us--worldwide. Lost and seemingly unknown is the fact that we are current, educated, relevant, multi-dimensional people and tribal nations, and NOT the images, symbols, portrayals or caricatures that exist and constantly used in film and television to define us. This is about the baggage, the Hollywood baggage we can’t seem to ditch. The baggage that, has for decades, created inaccurate perceptions of who we are as the first people of the Nation. Baggage we have been trying to dump for years.